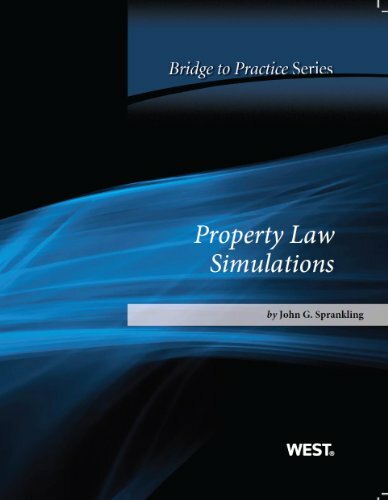 This book provides professors with twelve simulation exercises covering the topics most commonly taught in Property: adverse possession; gifts; estates and future interests; cotenancies; marital property; landlord-tenant law; real property sales; easements; covenants; nuisance law; eminent domain; and regulatory takings. Each exercise is based on a case file containing realistic legal documents which an attorney practicing property law would encounter. The book emphasizes the core skills of negotiation and advocacy. Seven exercises provide basic instruction in negotiation techniques, focusing on teaching students how to use substantive law to enhance their bargaining positions. In three of the advocacy exercises, students make closing arguments in a court trial; the other two advocacy exercises allow students to participate in a complete one-hour jury trial. The comprehensive teacher’s manual provides guidance for professors on: (a) how to use the exercises without reducing course coverage; (b) the substantive issues involved in each exercise; and (c) time-efficient methods for assessing student performance. For more information visit the companion site.